Jian Ghomeshi's lawyer, Marie Henein, has taken Tom Mulcair to task for tweeting #IBelieveSurvivors on the day that her client was acquitted of sexual assault charges, suggesting the NDP leader was just seeking to get votes. Whats the matter tom, all men guilty? All women instant victims? Even if they lie openly in court? No matter what one thinks of the verdict, we expect, in the least, that a politician would should respect for the rule of law, other wise, if they don't, why should we? It's starting to be that women in general are sick and tired of these feminists and their manginas, stronger and more assertive women are making their way into the halls of power, and justice. The idea that all men bad, all women victims is an insult to them and the men around them, they look at their husbands, sons, brothers and father, and don't see what these people with an axe to grind claim. Then we have another who claims he will keep on saying he's a feminist until people accept it as normal, well to him I say, "good luck with that". Bringing university radicalism into government doesn't work and is passer. And one risks becoming a world wide laughing stock. 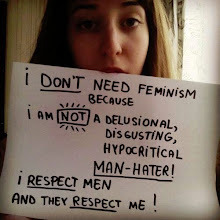 Most know what the term means and women see men who claims to be feminists as weak males who forgot their masculinity. Women starting to explain; Why Im NOT a Feminist! Fan reaction to final season of Son's of Anarchy.